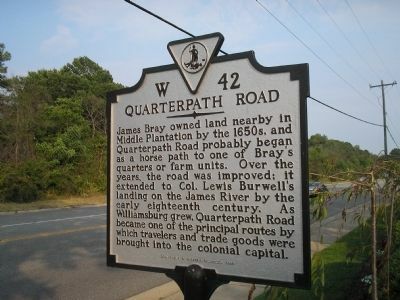 James Bray owned land nearby in Middle Plantation by the 1650s, and Quarterpath Road probably began as a horse path to one of Bray’s quarters or farm units. Over the years, the road was improved; it extended to Col. Lewis Burwell’s landing on the James River by the early eighteenth century. As Williamsburg grew, Quarterpath Road became one of the principal routes by which travelers and trade goods were brought into the colonial capital. Location. 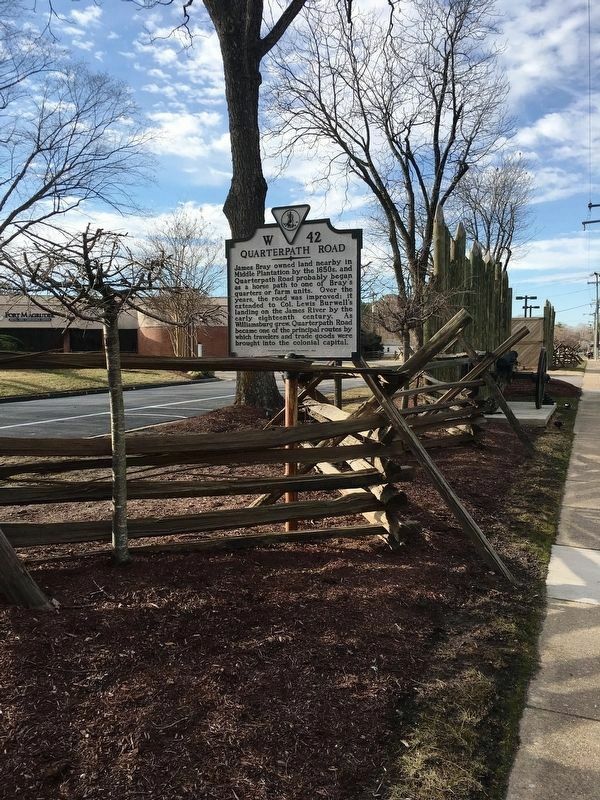 37° 15.848′ N, 76° 40.707′ W. Marker is in Williamsburg, Virginia, in James City County. Marker is at the intersection of Pocahontas Trail (U.S. 60) and Avon Avenue, on the right when traveling east on Pocahontas Trail. Touch for map. 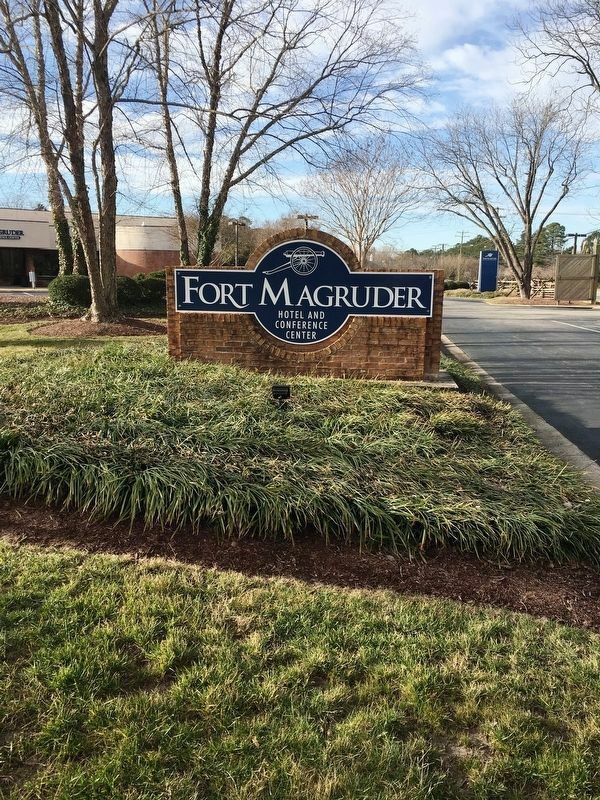 The marker is in front of the Fort Magruder Hotel and Conference Center. Marker is in this post office area: Williamsburg VA 23185, United States of America. Touch for directions. of this marker); a different marker also named Battle of Williamsburg (about 300 feet away, measured in a direct line); History of Fort Magruder (about 600 feet away); Magruder’s Defenses (approx. 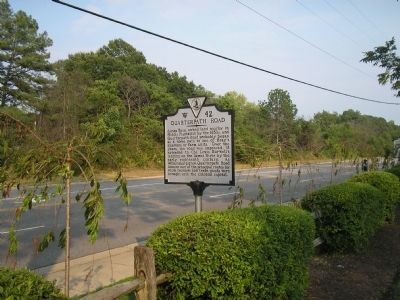 0.3 miles away); a different marker also named Battle of Williamsburg (approx. 0.4 miles away); a different marker also named Quarterpath Road (approx. half a mile away); Vineyard Tract (approx. 0.6 miles away). Touch for a list and map of all markers in Williamsburg. More. Search the internet for Quarterpath Road. Credits. This page was last revised on March 1, 2019. This page originally submitted on August 20, 2008, by Bill Coughlin of North Arlington, New Jersey. This page has been viewed 1,153 times since then and 32 times this year. Last updated on February 27, 2019, by Brandon D Cross of Flagler Beach, Florida. Photos: 1, 2. submitted on August 20, 2008, by Bill Coughlin of North Arlington, New Jersey. 3, 4. submitted on February 27, 2019, by Brandon D Cross of Flagler Beach, Florida. • Bill Pfingsten was the editor who published this page.